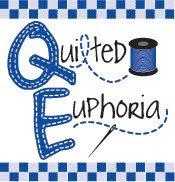 Having learned how to quilt from watching her grandmother, Amber at Quilted Euphoria started quilting when she was 19. She has been married for four and a half years to her best friend, is a stay-at-home-wife, and has a “fur baby” named Milo. Not only does Amber love to quilt, but she has an Etsy Shop where she takes orders for quilts, tote bags, pillows, bookmarks, etc. She also does giveaways, has patterns for sale, does customized orders and would love to "inspire your quilting eye," so contact her if there is something that you're interested in. Thanks for the feature, it made my day! Have a great weekend! Thanks for hosting Friendly Friday!